Pablo Picasso was born in Málaga in 1881. A naturally gifted artist he moved with his family to Barcelona in 1895. He spent a year studying at the Barcelona School of Fine Arts and won a gold medal with his large academic canvas, Science and Charity, which is now on display in the Museu Picasso in Barcelona. He went on to study at the Academy of Fine Arts in Madrid when he was 16 but only stayed a few months before he opened his first studio in Barcelona. Picasso spent the four years from 1900 between Paris and Barcelona. He painted pictures of the bohemian life in Paris and was most heavily influenced by the works of Degas and Toulouse-Latrec. His Blue Room, painted in 1901, is the best example of this. It is now on display in the Phillips Collection in Washington D.C.. Because various shades of blue dominated his rather melancholic paintings from 1901 until 1904 it has become known as his Blue Period. He finally settled in Paris in 1904. His paintings now became far more cheerful and the blue was replaced by pink. This Rose Period lasted for the next year or so and a common theme of the paintings that he produced during this time was the circus. The Family of Saltimbanques, painted in 1905, is on display in the National Gallery in Washington, D.C. This is the first of many paintings where Picasso used the figure of the harlequin to represent his alter ego. Picasso began to attract more influential patrons and painted numerous portraits. One of Gertrude Stein, the American writer, now hangs in the Metropolitan Museum of Art in New York. In 1906 Picasso produced pieces that were heavily influenced by Greek, Iberian, and African art and entered his Cubism period. This is evident in Les Demoiselles d’Avignon which is now on display in the Museum of Modern Art in New York. The picture includes heavily distorted figures that are recreated as having components rather than natural body form, typical of Cubism. He produced a number of works including a portrait of Daniel Henry Kahnweiler. This is now on display in the Art Institute of Chicago. Picasso’s cubism took on another dimension when he began working on collages with paper and cloth. His first collage, Still Life with Chair Caning, is on display in the Musée Picasso in Paris. He also produced a number of fine pencil drawings including a portrait, Vollard, which now hangs in the Metropolitan Museum of Art in New York. Picasso also revolutionized sculpture by creating pieces from everyday materials. One example, Guitar, is made of cardboard, paper, and string, and is on display in the Musée Picasso in Paris. As this technique was taken up by other sculptors of the time it became known as Constructivism. Picasso’s love life also had an influence on his work. He painted realistic portraits of his first wife and son in the early years from 1917. However, as the marriage disintegrated he moved into darker, more surrealistic images during the mid-1920s. He fell in love again in the early 1930s and his paintings took on another lighter mood. 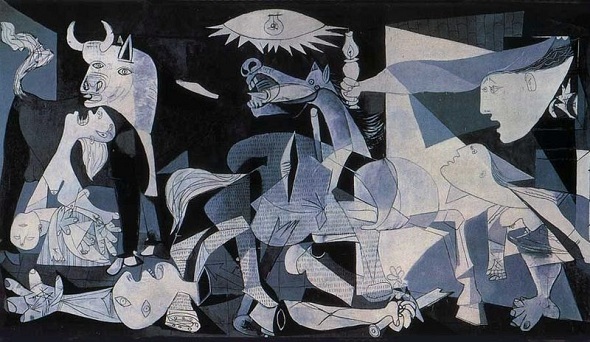 However, his most important work, Guernica, was a far darker picture. It was influenced by events during the Spanish Civil War. It now hangs in the Reina Sofía Art Centre in Madrid. Picasso died in 1973. Because Pablo Picasso opposed the Franco regime in Spain and lived in Puerto Rico for this reason, his painting, Guernica, hung in the Metropolitan Museum of Art in New York until Franco’s death. How very interesting that his painting of his first wife was realistic and after they split up his art became so bazar and abstract. The breakup of his true love had to have had a drastic impact on his emotions and mental health.